All of the guided trips with The Fly Shop® are fly fishing and catch-and-release only. 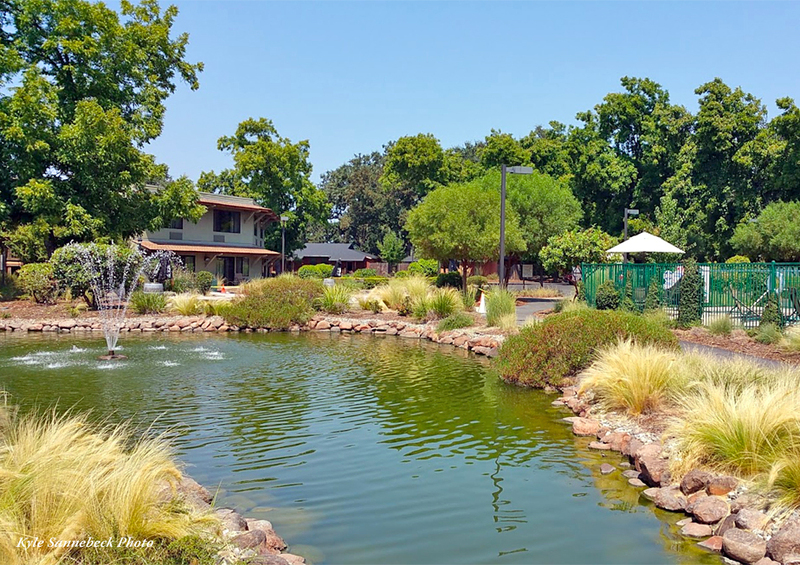 There are literally dozens of great Stillwater venues within range of our guide staff here in Redding, with options for all of the different seasons. Lakes can be technical fisheries, and spending a day on one with one of our guides will definitely help the learning curve for beginner, intermediate, and even advanced anglers. Below (fishing section) are a few of our favorite lakes to guide throughout the year. Often one lake will fish better than another at a given time, and our guests will sometimes request a specific stillwater venue, or just arrange for an “open” lake fishing trip, determining the exact location based on the guides’ expertise and what’s fishing well when you’re here. Included in your guided angling package for Regional Lakes is 8-10 hours of guided fishing with lunch provided. Each of the many different great fly fishing lakes in Northern California offer different seasons for when they fish best. 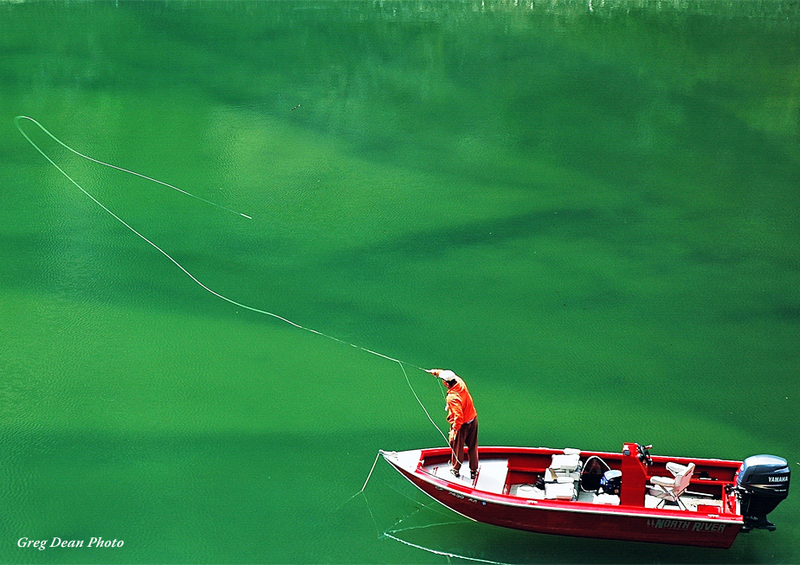 Keswick Reservoir is open to fishing year round, and fishes well throughout the year. That said, we've found that the best times of year on Keswick are the winter, spring, and early summer, from November through June. Access on this stretch of water is very limited; our guides utilize jet boats to motor upstream and drift back down. Iron Canyon Reservoir is open to fishing year round, but our favorite time of year to fish this beautiful mountain gem is the winter and spring. The lake is often low at this time of year, making for great opportunities to sight-cast to cruising rainbow and brown trout. We generally fish Iron Canyon out of drift boats, efficiently working the edges and current seams. There are a couple of prime-time seasons on Lewiston Lake: the first is the winter time, from November through April, while late summer (July, August, and September) can also be productive. 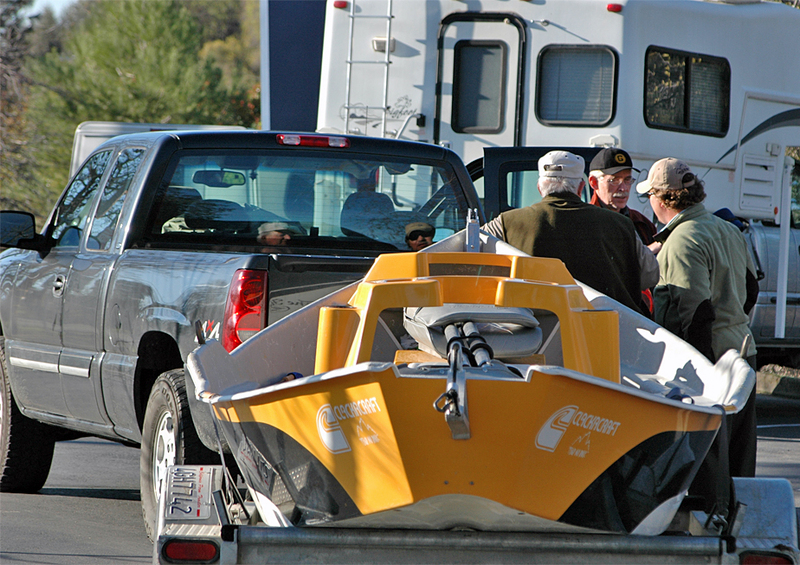 Some of our guides use jetboats, while others prefer the stealth of drift boats, to fish Lewiston Lake. They're both affective ways of targeting Lewiston Lakes trophy rainbows. Our favorite times of year to fish Lake McCumber is during the winter and spring. As long as there isn't too much ice on the lake, it fishes well, often with dry flies, throughout the winter and spring months. The fish don't get as large on McCumber as they do on some of our other lakes, but there's a lot of them! Our guides use drift boats on Lake McCumber to sneak up on the hungry fish. Late spring through Autumn has got to be the most amazing time to fish Manzanita. The sunny, warm days of summer are so comfortable. Just right. Add to that hatches of Callibaetis and rising rainbows and a few brown trout, well, now you have a recipe for a quality fly fishing adventure. During the Autumn months, cool crisp air and fall colors dominate the cathedral like setting of Manzanita Lake. Although the fish are not feeding on the surface for lack of insect hatches during the fall season, don't doubt these fish. Beetle and ant patterns produce hook ups until old man winter wraps this destination in ice, snow and frost. Winter can be really cold. Snow fall limits access to the boat ramp. The spring months can be great, but beware of logs and trees floating in the lake. You can't miss them! Everywhere! Snow melt coming off of Mt. Shasta and surrounding watersheds can diminish lake visibility. Some of the best fishing on this lake occurs from July through the Autumn months. Baum Lake is open every day of the year, but it is a truly great winter fishery, from November through April, with high numbers of Rainbow and Brown Trout ranging from 12 inches to 8 or 9 pounds. All manner of techniques work on this beautiful lake, from indicator nymphing to small dry flies to streamers. When every other piece of water in the North State is blown out from winter storms, Baum Lake always remains a fishable option. Motors are absolutely not allowed on Baum Lake, so it is also a quiet, peaceful winter-time experience. Our guides generally use their drift boats on the lake, drifting in the soft current and casting along the edges of the weed beds. Below are a few of our favorite lakes to guide throughout the year. Often one lake will fish better than another at a given time, and our guests will sometimes request a specific Stillwater venue, or just arrange for an "open" lake fishing trip, determining the exact location based on the guides' expertise and what's fishing well when you're here. spotting eagles, osprey, bobcat, and deer are all common occurrences, and the trout are equally wild. 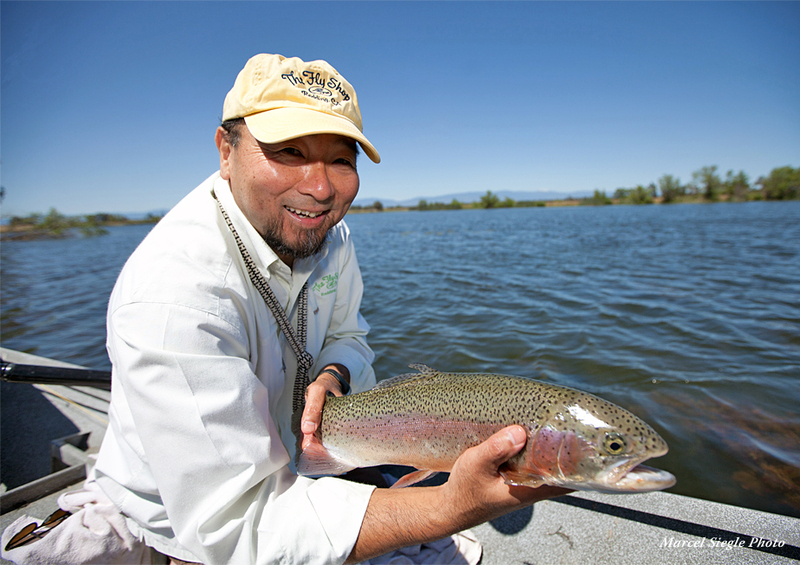 The Rainbow Trout in this portion of the Sacramento System are all native fish, averaging in the 14-22 inch range. Indeed, fishing on Keswick is often comparable to fishing on the Lower Sacramento, drifting indicators and weighted nymphs with the current, although dry fly and streamer fishing options are often available. Access on this stretch of water is very limited; our guides utilize jet boats to motor upstream and drift back down. Keswick fishes well throughout the year, with the prime time being the winter, spring, and early summer, from November through June. Iron Canyon Reservoir is another fishery that receives very little pressure, and features both stillwater options and areas with current, more akin to stream fishing. Indicator nymph fishing predominates the effective techniques throughout the winter months, and dry flies can be quite productive as well, especially in the springtime. The fish in this scenic reservoir are a mixture of brown and rainbow trout, with an equal mixture of wild and hatchery fish. This is one of the best places anywhere to simply hook a lot of fish, with 50+ hookups a likely possibility any day on the water, and fish averaging 13-24 inches. We generally fish Iron Canyon out of drift boats, efficiently working the edges and current seams. Manzanita Lake can easily be fished from a float tube, pontoon boat or even a drift boat or raft. And yes, there is more than enough walkable and wadable shore access allowing anglers to hunt the shaded coves and undercut banks of this lake for cruising rainbow and brown trout. Located in Lassen National Park at 2,900' elevation, Manzanita Lake is a perfect high mountain jewel of a lake. Surrounded with dense conifirous forrests, it's common to find bald eagles soring the gentle afternoon winds, deer grazing in the meadow and a variety of birds from Ducks to Fly Catchers, Jays, Swallows, Finches, Dippers and Wrens. Whew! Enough birds to keep the avid birder busy all day. The cold clear water, excellent hatches of Callibaetis all summer long, big trout and a magnificent views of Mt. Lassen make time spent on this lake a remarkable fly fishing experience, unique to Northern California. McCloud Reservoir is also known and Lake McCloud. At 520 acres, the lake is formed behind an earthen dam constructed in 1965. The upper McCloud River flows into the lake at the Northern end. The waters are cold and clean. The entire lake is surrounded by thick, green forests. Views of Mt. Shasta command the grand McCloud Reservoir fishing experience. Sitings of Bald Eagles, Osprey, Bear, Dear and River Otters are common. Anglers will find wild rainbow and brown trout in McCloud Reservoir. The fishing can be very good! But this lake is by far best fished out of a boat since bank access is very limited. Anglers routinely loose count of the numbers of fish eating Pheasant Tail Nymphs and Woolly Buggers. The DFW plants the lake regularly with rainbow trout adding the reassurance that fly rods will be bent and fish brought to net. McCloud Reservoir is a great option for the kids! If Keswick Reservoir marks the true beginnings of the Lower Sacramento River, so does Lewiston Lake function as the "headwaters" of the Trinity River. Lewiston is essentially a holding channel between Trinity Lake and Lewiston Dam; as it meanders peacefully through weed-lined channels, it often bears remarkable resemblance to a spring creek. Fly fishing on Lewiston Lake is a great deal like fishing some of the bigger spring creeks of the west, such as Fall River or Silver Creek. Anglers on Lewiston Lake often find themselves sight-casting to large trout, usually casting light tippets (5X and 6X) with small flies (#18-22), with a variety of techniques, from indicator nymphing to small dry flies. Lewiston Lake is a true trophy trout fishery, and one of the best places anywhere to hook and land trout in the 4-6 pound range, and trout up to 12 pounds are landed each year. Lewiston is open year-round, but prime time on the lake runs in the winter time, from November through April. July, August, and September can also be productive. Lake McCumber is one of our favorite dry fly Stillwater fly fisheries in the late winter and early spring. Our guides wait each winter for the lake's ice to clear, knowing that as soon as they can get their drift boats into the lake the fishing will most likely be great. Lake McCumber is stuffed with rainbow and brown trout, and although they don't generally grow large (average fish are 10-14 inches) they are plentiful and often respond aggressively to dry flies. On the rare days where they don't look to the surface to feed, McCumber's rainbow and brown trout will readily eat streamers fished on intermediate lines, or nymphs and midge pupae suspended under small indicators. Located near Hat Creek outside of the town of Burney, Baum Lake is a "spring creek lake," meandering through weedy channels in a beautiful, open valley. It is a truly great winter fishery, from November through April, with high numbers of Rainbow and Brown Trout ranging from 12 inches to 8 or 9 pounds. All manner of techniques work on this beautiful lake, from indicator nymphing to small dry flies to streamers. Motors are absolutely not allowed on Baum Lake, so it is also a quiet, peaceful winter-time experience. Our guides generally use their drift boats on the lake, drifting in the soft current and casting along the edges of the weed beds. 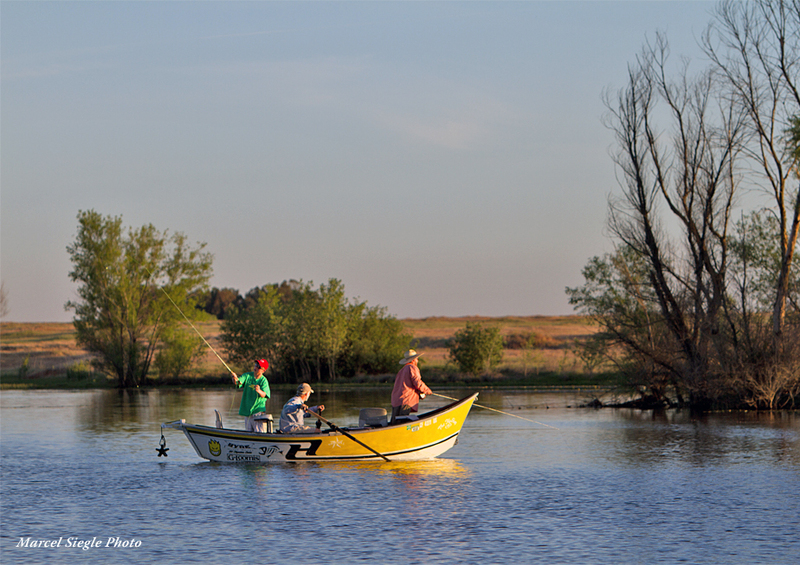 Most of the region's great fly fishing lakes are only an hour's drive from Redding, making Redding a great home base for fishing our local stillwaters. • The Gaia Hotel in Anderson is one of the newest hotels in the area. It's eco-friendly design is relaxing, and combined with a great bistro-style restaurant and spa it's more than just a place to stay. The Gaia is right on the river, and offers discounted rates for guests of The Fly Shop®. • Oxford Suites has big, clean, comfortable rooms for a good price, along with complimentary buffet breakfast, central location, and a short walk to some great Redding restaurants. • The Hilton Garden Inn is a great choice for lodging in Redding, with discounts available for guests of The Fly Shop. They are just down the street, have a good restaurant, and even have rooms with views of the river. Most of our stillwater fishing adventures start by meeting here at The Fly Shop® in Redding. To get to The Fly Shop, take Exit #675 off Interstate 5 (Churn Creek Rd). Turn East onto South Bonnyview Rd, then turn left (north) onto Churn Creek Rd. Proceed north for about ½ mile, and you’ll find The Fly Shop® on the left hand side. For more specific information on getting to the various stillwater destinations here in Northern California, please just give our team at The Fly Shop® a call at 800-669-3474 and we’ll be happy to help!